TS2DX is new additions in Aclas ARM based touch scales series. 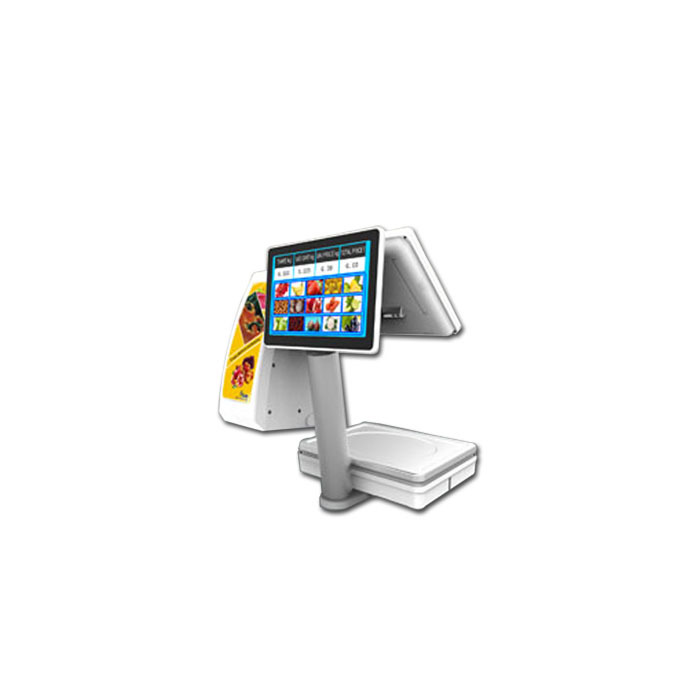 Its features an open platform OS and 12 and 10 or 12 inches Operator and Customer touch display respectively. It is double body design printer on the upper part of the Scale provides the water-resistance benefits and elevated tower design gives amazing user experience. ARM-based touch scales having open platform Operating System (Windows CE, Linux, and Android). Double designed body, printer on top elevated tower design carry improved user experience. Support label and receipt printer concurrently. 12inches operator and 12″ or 10inches customer touch screen. 1 label printer + 1 monitor for self-service use as well as 1 label printer +2 monitors + 1 receipt printer for shops use. Connect with the backoffice to understand actual time PLU, sales and stock managing, setup a scales network (master ans slave) with balanced seller specifications. Integrated Scaling apps (prepack, sales, self-service), or offers SDK for 3rd-party software development. Supports Communication port: 1*Ethernet, 1*Drawer, 2*USB, 1*Serial port. 915,9th Floor, Uni Plaza, I.I. Chandigarh Road Karachi, Pakistan. A-31 katcha ferozepur Road,Mozung Chowrangi,Lahore. Ground Floor Hakim Building-Hakimabad Nowshera,KPK Pakistan. Behind Toyota Showroom, Al Wahda Street, Sharjah, UAE P.O. Box: 23215. New Industrial Area Ajman, Behind Fruits And Vegetable Market, Shade Number: 113, Beside Ahlan Super Market. Jeddah, Khalid Bin Walid Street. Walid Center. 1st Floor. Office No.107 Business Soft. Riyadh, Khurais Road Exit.30. AL Nahda Dist.Behind AUDI Showroom, Optical Arrow Trading Est.